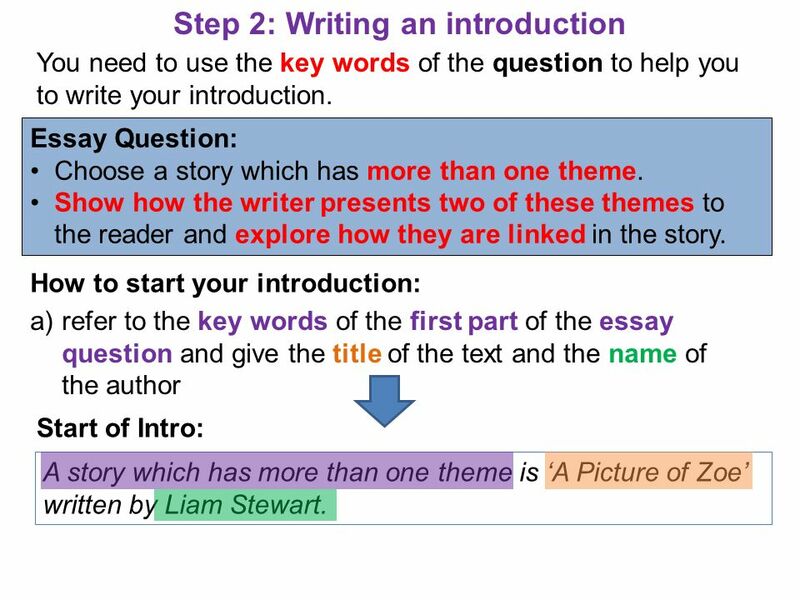 You need to use the key words of the question to help you to write your introduction. Essay Question: Choose a story which has more than one theme. Show how the writer presents two of these themes to the reader and explore how they are linked in the story. 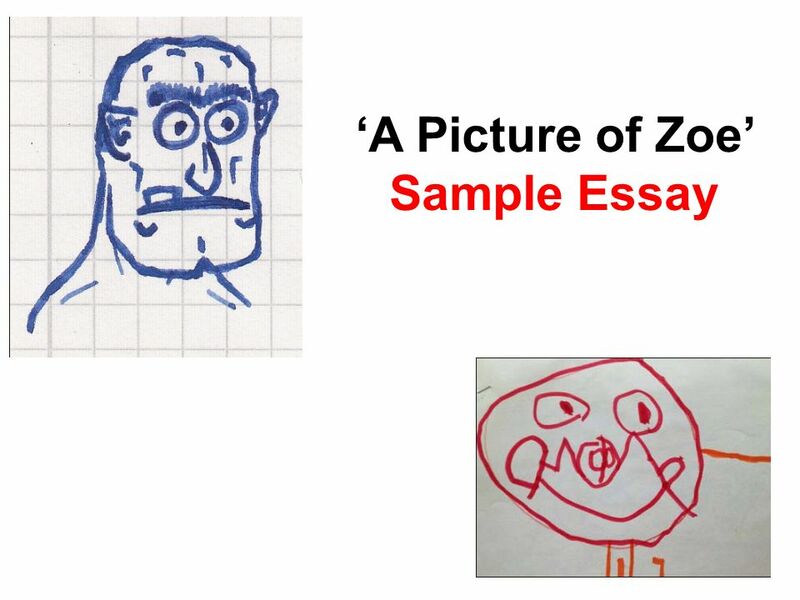 How to start your introduction: a) refer to the key words of the first part of the essay question and give the title of the text and the name of the author Start of Intro: A story which has more than one theme is ‘A Picture of Zoe’ written by Liam Stewart. 4 At this point you can refer to the text’s theme(s) and give a brief summary. 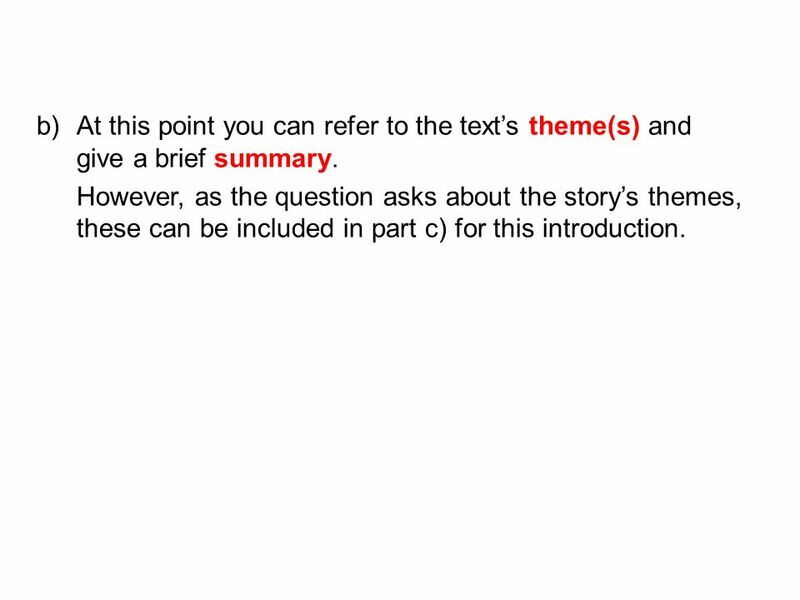 However, as the question asks about the story’s themes, these can be included in part c) for this introduction. 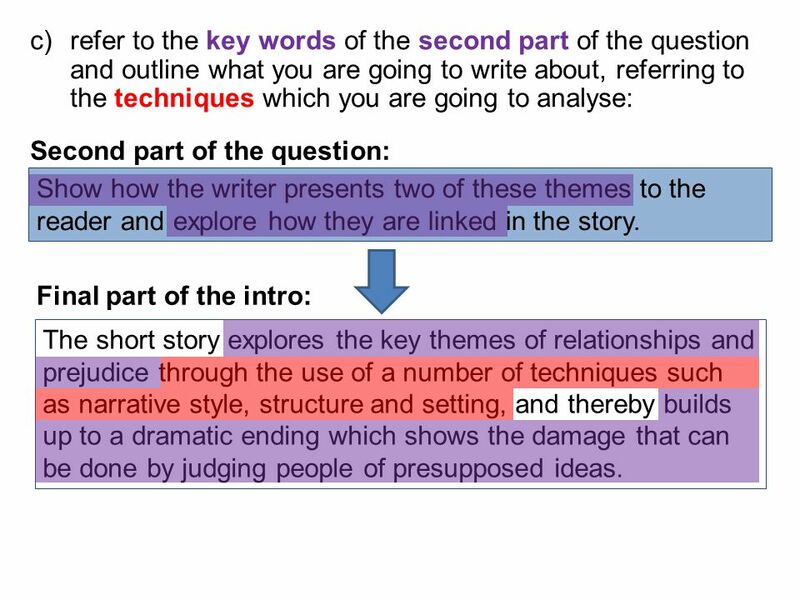 5 refer to the key words of the second part of the question and outline what you are going to write about, referring to the techniques which you are going to analyse: Second part of the question: Show how the writer presents two of these themes to the reader and explore how they are linked in the story. Final part of the intro: The short story explores the key themes of relationships and prejudice through the use of a number of techniques such as narrative style, structure and setting, and thereby builds up to a dramatic ending which shows the damage that can be done by judging people of presupposed ideas. 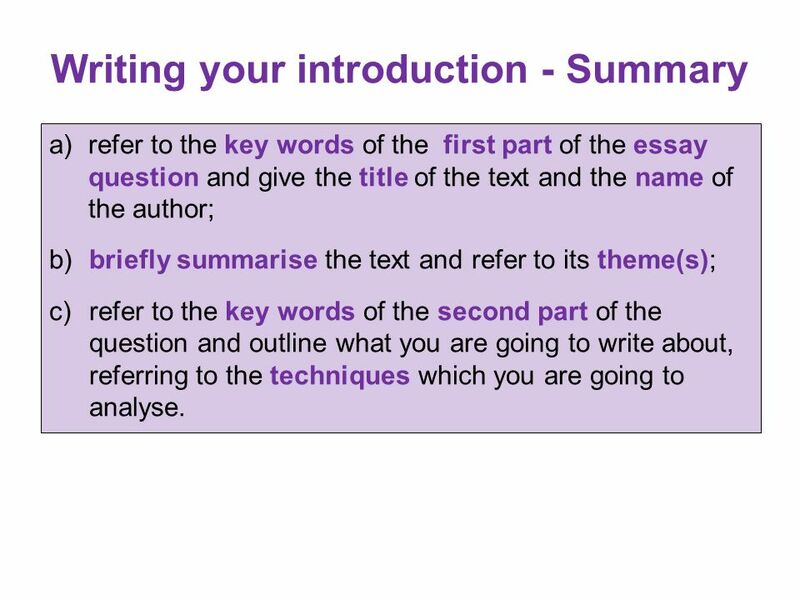 a) refer to the key words of the first part of the essay question and give the title of the text and the name of the author; b) briefly summarise the text and refer to its theme(s); refer to the key words of the second part of the question and outline what you are going to write about, referring to the techniques which you are going to analyse. 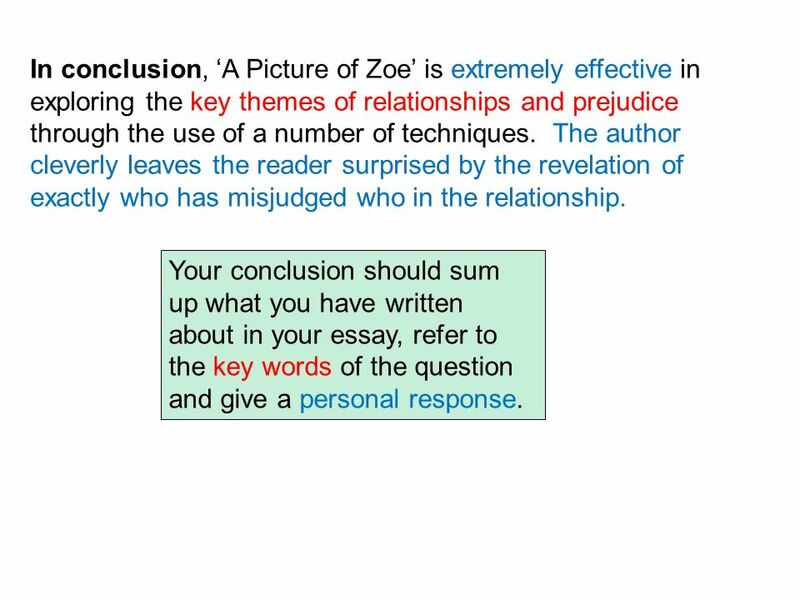 refer to the key words of the first part of the essay question and give the title of the text and the name of the author A story which has more than one theme is ‘A Picture of Zoe’ written by Liam Stewart. The short story explores the key themes of relationships and prejudice through the use of a number of techniques such as narrative style, structure and setting, and thereby builds up to a dramatic ending which shows the damage that can be done by judging people of presupposed ideas. 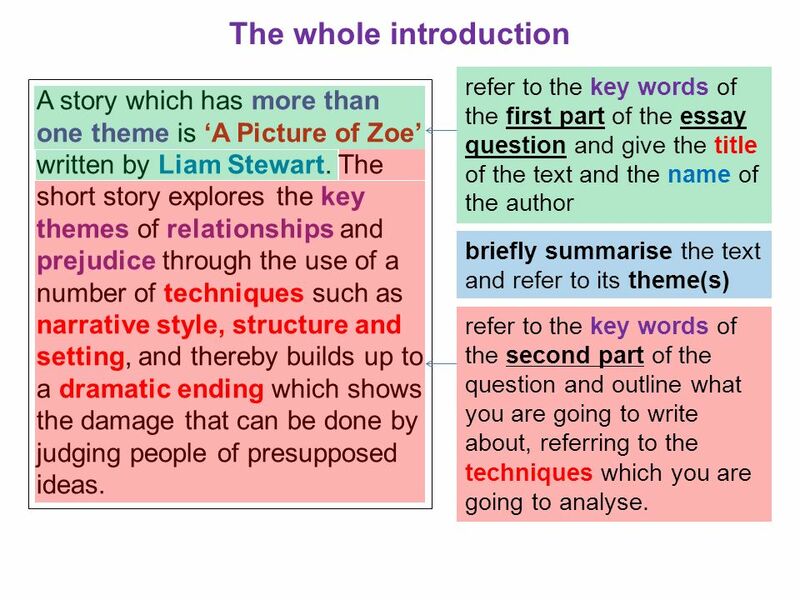 briefly summarise the text and refer to its theme(s) refer to the key words of the second part of the question and outline what you are going to write about, referring to the techniques which you are going to analyse. 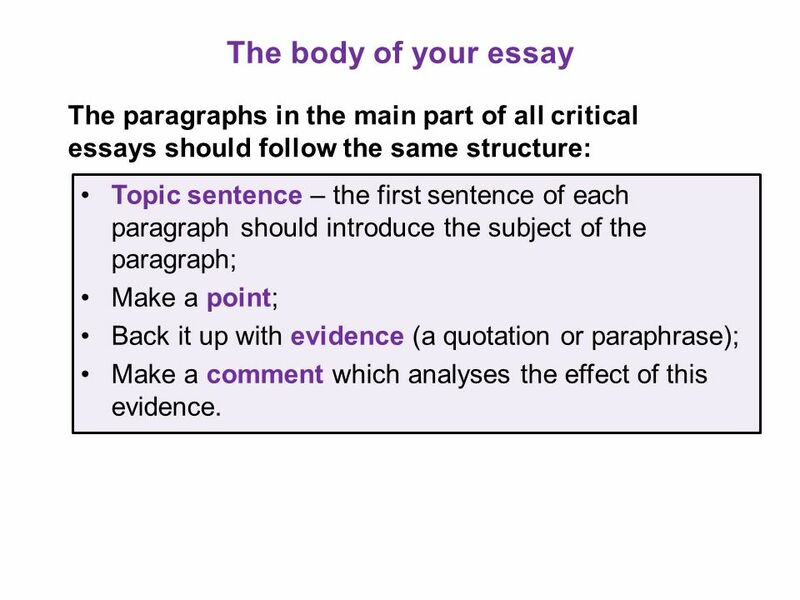 8 The body of your essay The paragraphs in the main part of all critical essays should follow the same structure: Topic sentence – the first sentence of each paragraph should introduce the subject of the paragraph; Make a point; Back it up with evidence (a quotation or paraphrase); Make a comment which analyses the effect of this evidence. 9 Using a quote is like building a good burger! 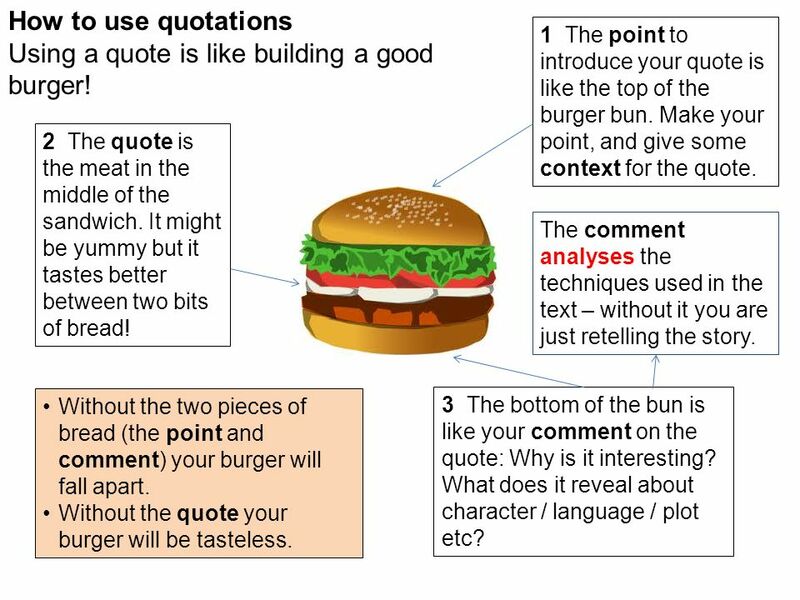 How to use quotations Using a quote is like building a good burger! 1 The point to introduce your quote is like the top of the burger bun. Make your point, and give some context for the quote. 2 The quote is the meat in the middle of the sandwich. It might be yummy but it tastes better between two bits of bread! 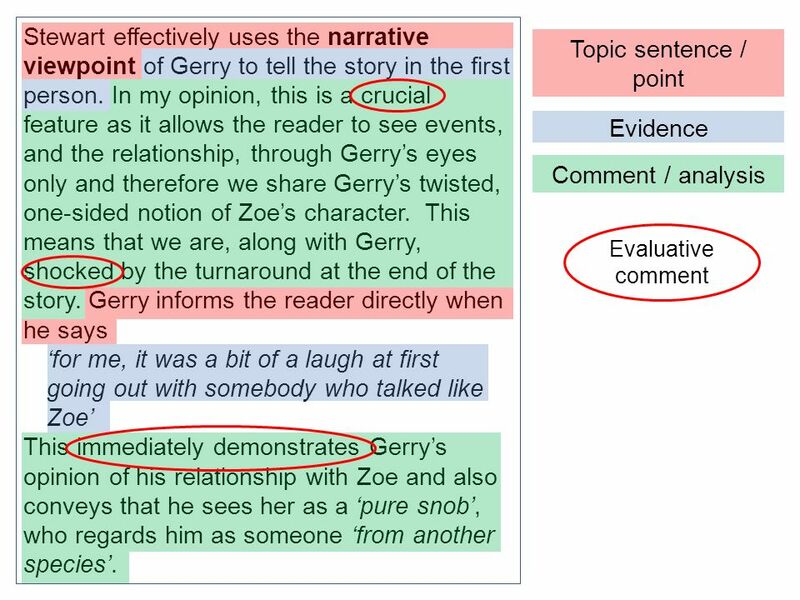 The comment analyses the techniques used in the text – without it you are just retelling the story. Without the two pieces of bread (the point and comment) your burger will fall apart. Without the quote your burger will be tasteless. 3 The bottom of the bun is like your comment on the quote: Why is it interesting? What does it reveal about character / language / plot etc? 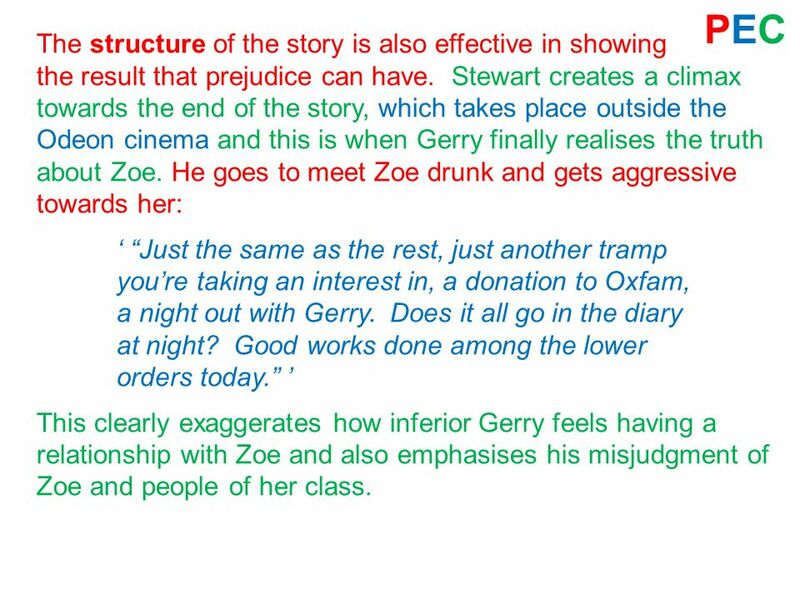 12 PEC Stewart also uses setting to enhance the degree of Gerry’s prejudice throughout his relationship with Zoe. The story revolves around Glasgow city centre and mentioning actual places such as Lauders, the South Pacific, Dumbarton Road, Bearsden, and the Odeon, gives a greater sense of reality, as do the dialect words used, such as “he’s now ofsky to England” and “His patter’s terrible”. The events in the story also add to this sense of realism, demonstrating the typical world of dating to the reader. 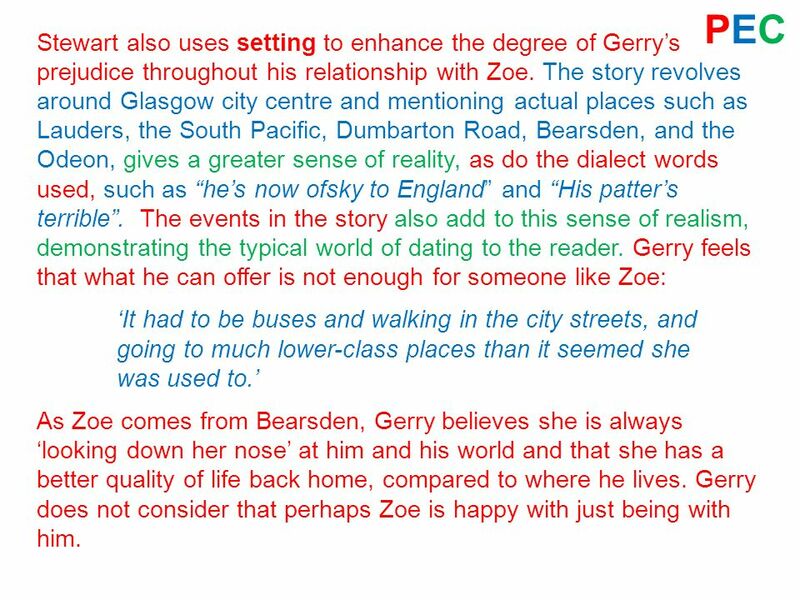 Gerry feels that what he can offer is not enough for someone like Zoe: ‘It had to be buses and walking in the city streets, and going to much lower-class places than it seemed she was used to.’ As Zoe comes from Bearsden, Gerry believes she is always ‘looking down her nose’ at him and his world and that she has a better quality of life back home, compared to where he lives. Gerry does not consider that perhaps Zoe is happy with just being with him. 13 PEC The structure of the story is also effective in showing the result that prejudice can have. Stewart creates a climax towards the end of the story, which takes place outside the Odeon cinema and this is when Gerry finally realises the truth about Zoe. He goes to meet Zoe drunk and gets aggressive towards her: ‘ “Just the same as the rest, just another tramp you’re taking an interest in, a donation to Oxfam, a night out with Gerry. Does it all go in the diary at night? Good works done among the lower orders today.” ’ This clearly exaggerates how inferior Gerry feels having a relationship with Zoe and also emphasises his misjudgment of Zoe and people of her class. 14 PEC When Zoe can finally speak the reader is shocked to discover that the story is not in fact about Zoe looking down on Gerry but is actually based on the prejudices that Gerry has about her: ‘ “I never invited you out to my house because I felt absolutely certain you wouldn’t want to come.” ’ Throughout the couple’s relationship, they did not go out to Bearsden, but the reader learns that this was not down to the fact that Zoe didn’t want him to go but that she was quite happy going wherever Gerry wanted to go and didn’t want him to feel uncomfortable. 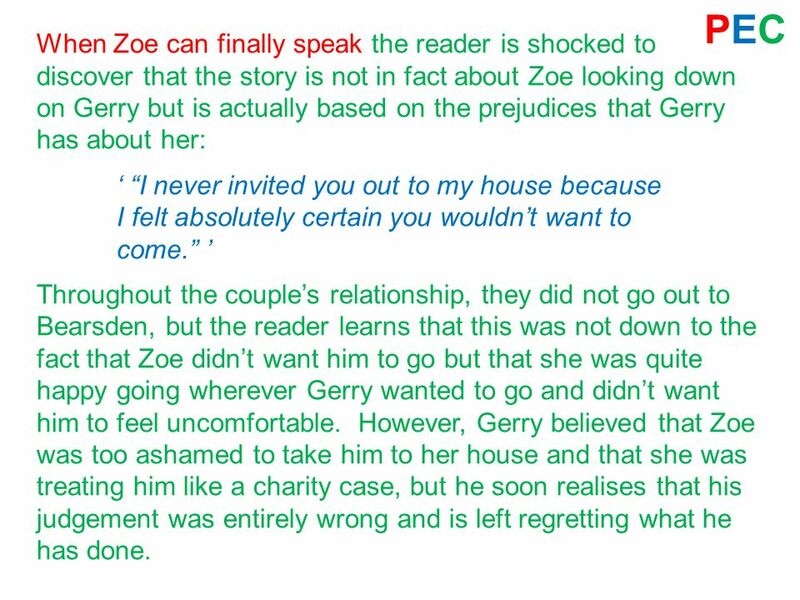 However, Gerry believed that Zoe was too ashamed to take him to her house and that she was treating him like a charity case, but he soon realises that his judgement was entirely wrong and is left regretting what he has done. 15 PEC The title of the story itself refers both to the actual picture of Zoe (which she takes from her bag at the end of the story and which symbolises the poor judgement Gerry had of her) and the metaphorical and highly incorrect picture of Zoe which exists in Gerry’s mind. The ending of the story convincingly sums up the result of Gerry’s actions. The fact that he is in the South Pacific a year on creates a cyclical structure, which reflects that he cannot move on. The fact that Gerry is watching the artist sketching a man who treats him with disdain further reminds Gerry of his mistake and how he has ‘thrown away a pearl’. 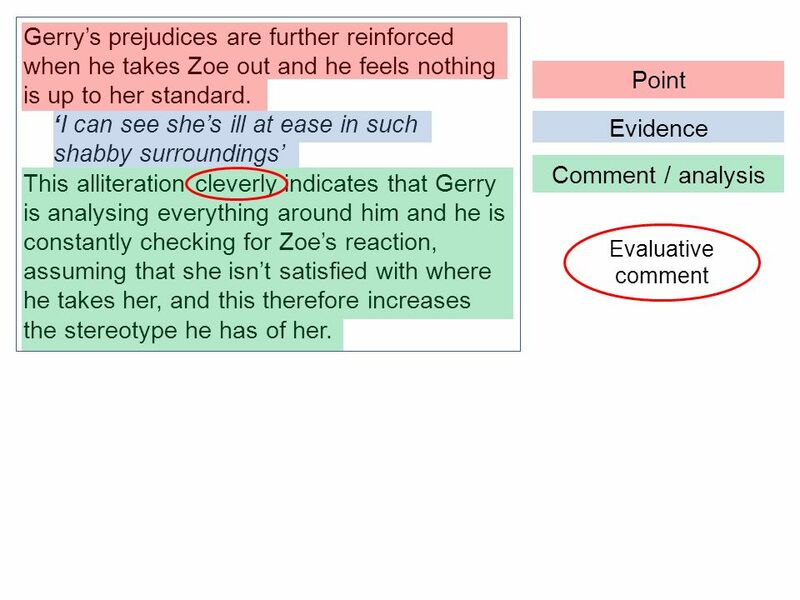 16 In conclusion, ‘A Picture of Zoe’ is extremely effective in exploring the key themes of relationships and prejudice through the use of a number of techniques. The author cleverly leaves the reader surprised by the revelation of exactly who has misjudged who in the relationship. 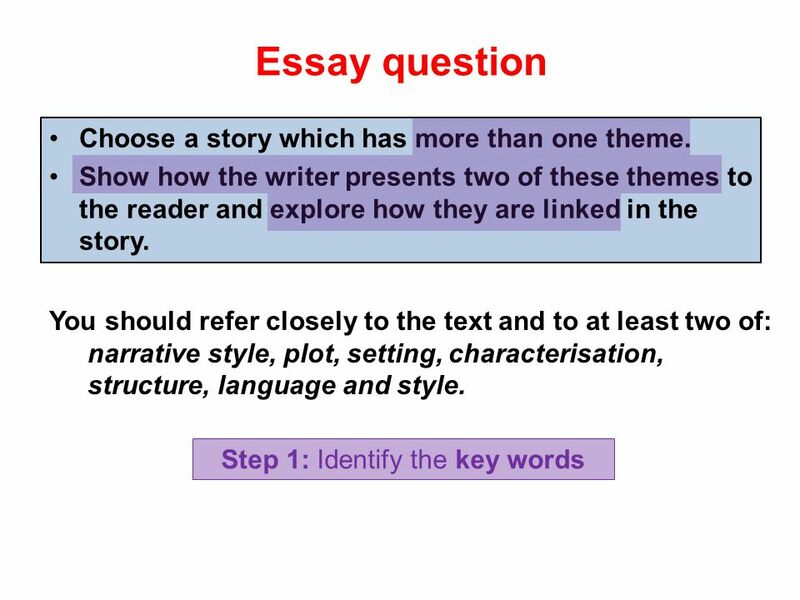 Your conclusion should sum up what you have written about in your essay, refer to the key words of the question and give a personal response. 17 Now it’s your turn! Look at the essay questions on the last page of your booklet. 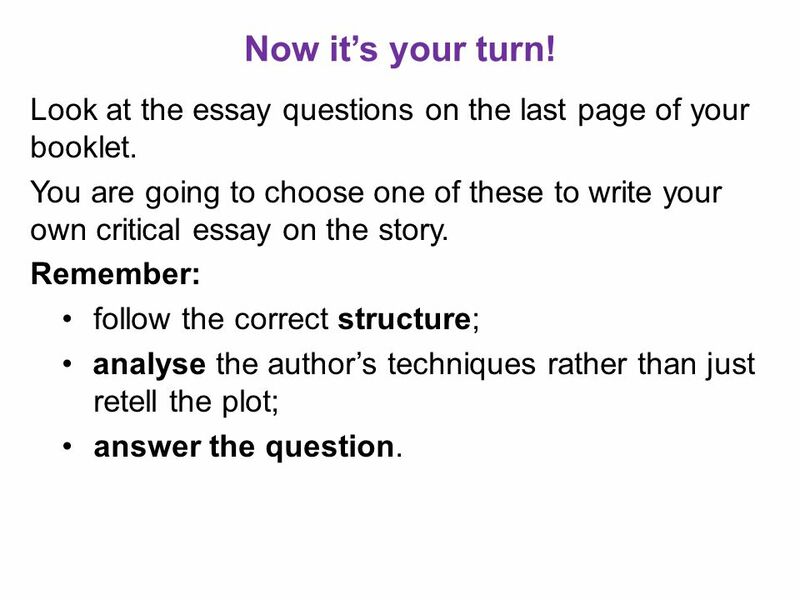 You are going to choose one of these to write your own critical essay on the story. Remember: follow the correct structure; analyse the author’s techniques rather than just retell the plot; answer the question. 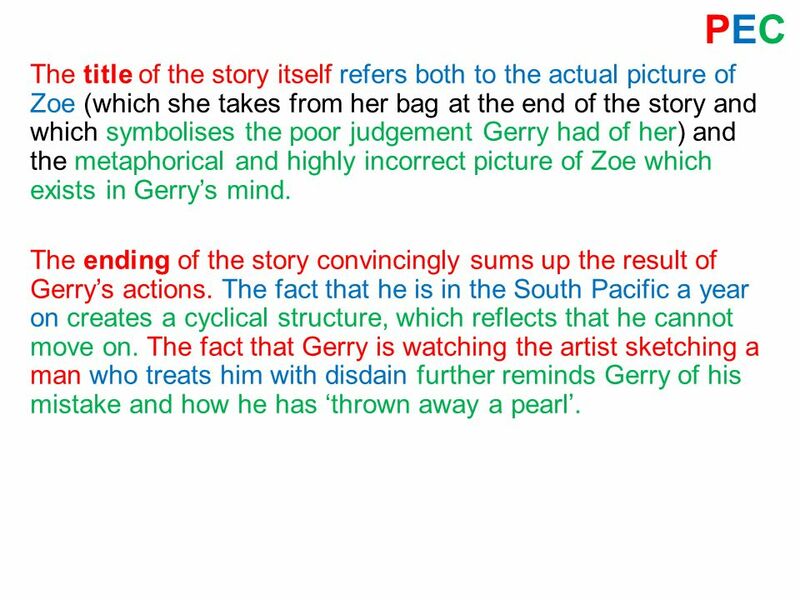 Download ppt "‘A Picture of Zoe’ Sample Essay"
Feedback from The Great Gatsby style analysis essays: Thesis statements · HOW do we know Nick's opinion? Through imagery? diction? tone? ·Don't use FIRST. You’re the author – what were your intentions?  A dot point outline of unrelated, random thoughts loosely connected to your writing  A plan for your. Bullet-Proof Essay The Masterwork of Olga Ardulov. What is the purpose of your essay? To argue/contend. Your essay will always work best if you have a strong contention and you argue it enthusiastically. By Shirley Jackson.  Published in 1948 in ‘The New Yorker’.  Caused uproar and thousands of people cancelled their subscriptions to ‘The New Yorker’. Intermediate 2/ Higher Critical Essay Prelim Support Notes. Essay Writing Freshmen Fall Theme A central, unifying or dominant idea – What was the main idea or message behind the story? Writing Tips. Introduction Don't simply echo the language of the assignment Avoid offering a history of your thinking about the assignment. Avoid beginning. Structuring an essay. Structuring an Essay: Steps 1. Understand the task 2.Plan and prepare 3.Write the first draft 4.Review the first draft – and if. ENGLISH II SEPTEMBER 26, 2011 Turn in worksheet for “And of Clay Are We Created” now. No warm-up today. Right now, get out a piece of paper to take notes.